Fair. Used, acceptable condition, there is shelf wear on cover, including creasing and marks, and the pages are tanned. Very Good. 0099532816 ALL BOOKS SHIPPED WITHIN 1 DAY OF PURCHASE! Good. 0099532816 ALL BOOKS SHIPPED WITHIN 1 DAY OF PURCHASE! Fine. No Jacket. 8vo-over 7¾-9¾" tall No date (recent) Larger format paperback. 218 pp. Fine condition. No inscriptions. Very Good. No Jacket. 8vo-over 7¼-9¼" tall Reprint. Octavo paperback. 191 pp. Slight sunning on spine, Very Good condition. No inscriptions. No dust jacket. All Quiet on the Western Front is one of the greatest books of the twentieth century about one of the deadliest wars of the twentieth century. 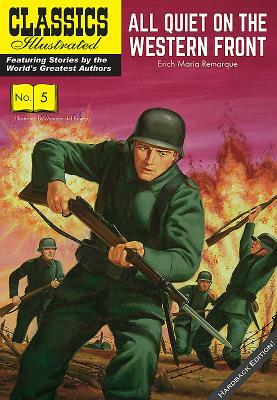 Erich Maria Remarque was a German soldier in World War I; in this book he develops the themes of lost youth, death, comradeship, and the senselessness of war. He tells of the dreadful sights, sounds, and smells of battle and life in the trenches as well as the disquieting experiences of bombardments, rats, and lice (as well as a bit of humor now and then). Though not an uplifting story, this is a powerful book that will change how one thinks about war and its destructive power on the human psyche; moreover, one gets a better understanding of the physical, emotional, and psychological damage that war has on those who fight it. Few books have brought me to tears; in sum, All Quiet on the Western Front is one of the saddest (and, ironically) and one of the best books I have ever read. Highly recommended. This is a wonderful book. It is beautifully written about an ugly time. Remarque shows the devastating effect of war on the mind and soul. This is the most interesting book I read in high school besides some Shakespeare. It is a book about war and should be gory, awful, and sad,; in the computer age Western people forget what war can do to a person, a region, a country. The whole point IS war is gory, awful, and sad. I am going to read it again after almost 20 years, and I will never forget how changed I was after my first read. Written by a German author after the First WW this is an antiwar book-but not antiwar in the modern sense. You are not hit over the head with moralisms. The truth of what war can be is slowly revealed through the young German soldier who tells the story. He doesn't tell us that war is hell. He tells his story simply as it unfolds and we can reach our own conclusions. He and his friends-since-childhood are simple young men from an ordinary upbringing. They don't really know what the war is about, or even why they're in it. They only know that their personal survival depends on learning a few basic lessons very quickly. However this book is much bigger than the sum of it's parts. It is a book that will stick in your brain and give you new ways of thinking about war-not as an abstract thing to be against-or for- but what war really means to individuals and their families and their society. I am neither pro or con war in general. I believe there are times when war may be the only solution. I am not a person who knows a great deal about war, either. But I learned a great deal from this book about why war should always be the last solution. And what war means to those who are in it, It has left an indelible impression on me and I haven't read it in 25 years. It it a book that should be read by anyone who wants to be a thinking person as part of a holistic viewpoint on life. This was the most awful,depressing,gory,horrible book i have ever read in my entire life. I would have quit reading it if i didn't have to read it for school. I think that this book should be banned from schools. There is not one good moment in it.